As much as I love carrying different handbags, I absolutely dread having to take all of my belongings out of my purse and reorganize it into a new one, which is why I tend to carry the exact same handbag for a really long period of time. If only it weren't so hard to change handbags, I would literally carry a new one every day to match whatever mood or outfit I was wearing at the time. 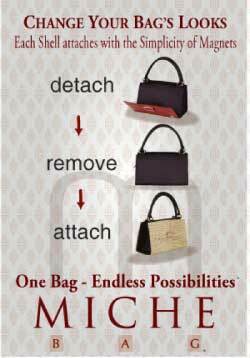 If you are like me and dread the changing of the purses, then Miche Bag is the solution for you. 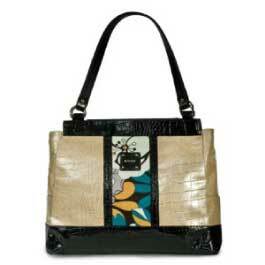 They have an entire line of interchangeable purses so that changing out your handbag takes only seconds. Keep reading to learn more! Since I'm the kind of gal who frequently carries everything but the kitchen sink around with me, I was thrilled to find that Miche Bag offers three different sizes of base bag: the big bag, classic and mini. 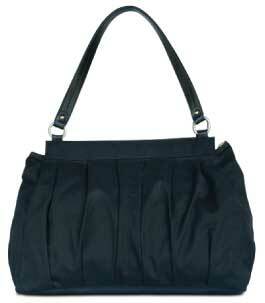 The base bag is actually the heart and soul of your purse and where all of your belongings will be housed. The big base bag consists of a twill material, so that it can easily be washed when necessary, as well as two removable purse straps. The true magic though comes from the two magnetic strips running along the top of the base bag. These magnetic pieces adhere to the complimentary magnetic pieces in every shell, which then locks the base into the shell making it appear as one cohesive handbag. There were a ton of inner pockets inside the big base bag, so that all of my smaller items could be organized for quick and easy access. 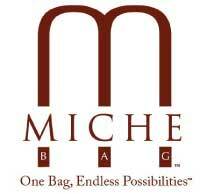 I thought that the Miche Bag's design was brilliant, and now switching out my handbag is no longer a chore. 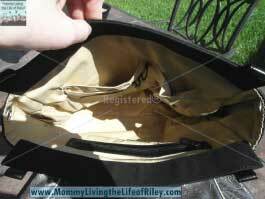 Simply lift up, remove the base bag and insert it into a different shell and you're DONE! The two shells I received were definitely of the highest quality and contained many useful features, such as streamlined side pockets, for high-use items like cell phones and keys. They even contained rivets on either side of the purse so that you could carry it using only one strap, instead of two, if that's your preference. I loved the classic and fun styling of the Lynette shell and thought that it looked perfect for taking out during the summer. 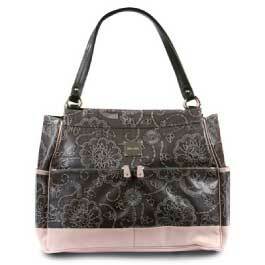 The Allison's gray and pink floral design made it ideal for any season and it goes well with many of the items in my closet, since gray is my favorite color. The only criticism I have of this excellently designed handbag system is in regards to the big bag base. When you look at the picture on their website, it appears that the base bag is a solid black color, both inside and out, but when it arrived, I was surprised to discover a tan colored lining. In my opinion, this is unnecessary and makes it so that the liner clashes with many of the different shells offered by Miche Bag. For instance, the tan lining does not look well at all with the Allison shell, though it does look perfect with the Lynette shell. If only Miche Bag had made the base bag solid black on the inside and out, there wouldn't be any way it would clash with any of their shells. If you are a designer handbag maven who would love to seriously cut down on the time it takes to switch out your purse to a different one, then I highly suggest shopping the large selection of sizes and styles offered by Miche Bag. Their base bag's make organizing your stuff super easy and now it only takes seconds to completely change your handbag's style and personality! Disclosure: I received the Big Bag Base, Allison Shell and Lynette Shell from Miche Bags in order to facilitate my review. No other compensation was received. This product review is based on my own personal experiences with this item and is completely honest and objective.